with Tim Mitchell Ask an Expert NORTON ROSE FULBRIGHT CALGARY Have a question for our experts? Email Jeffrey.R.Smith@thomsonreuters.com 2 | January 9, 2019 Accommodating employee disability resulting from reckless off-duty conduct Question: Does an employer have to accommodate an employee's temporary disability if it stems from an injury the employee sustained due to risky activity while off duty, and the accommodation is feasible but costs the employer money? 2 | January 23, 2019 Canadian HR Reporter, a Thomson Reuters business 2019 Answer: An employee's entitlement to over- time pay is governed by provincial employ- ment standards legislation, which gener- ally provides that a manager or supervisor is overtime exempt, meaning that a manager or supervisor is not entitled to overtime pay so long as the manager's primary duties are managerial in nature. Each province has a similar but distinct set of criteria to deter- mine if an employee's duties are managerial in nature (such as the ability to discipline or terminate staff ). ere is no set amount of time that an overtime-exempt individ- ual must work her primary duties to retain overtime exempt status. In many manage- rial positions, it is common for managers to complete some duties that are not normally considered 'managerial.' is often occurs when overtime-eligible employees are un- expectedly absent. Where occasional as- sistance on these types of tasks is required, a manager's overtime-exempt status would not change. However, there are cases where manag- ers would become eligible for overtime pay. For example, in Glendale Golf and Country Club Ltd. v. Sanago, an executive chef who was hired into what was intended to be an entirely managerial and supervisory role was entitled to almost $10,000 of overtime pay for weeks where his non-managerial and non-supervisory tasks took up more than 50 per cent of his working time. 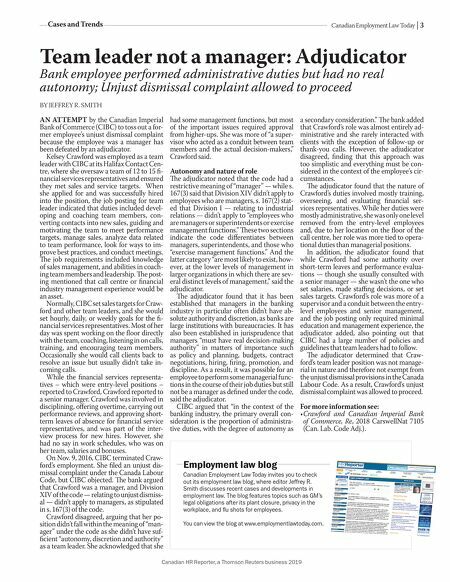 e Ontario Labour Board explained that the managerial exemption from overtime can apply even if the employee sometimes performs non- managerial or non-supervisory work, as long as the "essential character" of the work remains managerial or supervisory. e fact that the executive chef performed line cook- ing duties did not alter the character of his position. It was the frequency of performing line cooking duties that made the chef eli- gible for overtime. As a general proposition, a manager may perform non-managerial tasks and still be exempt from overtime, provided that such tasks are only performed on an irregular or exceptional basis. If a manager is fi lling in on a 'regular basis' which results in the manag- er's principal or primary duties shifting from managerial duties to employee duties, then a manager may be eligible for overtime. Employers should monitor the tasks that their managers and supervisors perform while at work. For weeks when a manager's managerial activities account for less than half of the hours spent at work, she should likely be paid overtime. In addition, employ- ers should be cautious and ensure that non- managerial and non-supervisory tasks are only performed by managers on an irregular basis to avoid becoming liable for overtime pay. For more information see: •Glendale Golf and Country Club Ltd. v. Sanago, 2009 CarswellOnt 12591 (Ont. Lab. Rel. Bd.). Tim Mitchell practices management-side la- bour and employment law with Norton Rose Fulbright in Calgary. He can be reached at (403) 267-8225 or tim.mitchell@nortonrose- fulbright.com. Answer: Employers are prohibited from discriminating in employment on the ba- sis of a protected ground as defi ned in hu- man rights legislation. 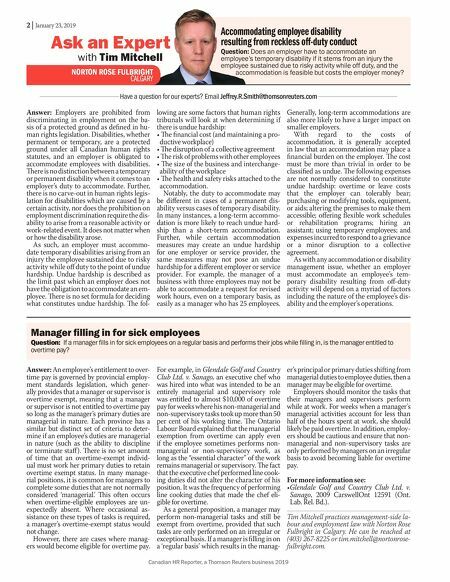 Disabilities, whether permanent or temporary, are a protected ground under all Canadian human rights statutes, and an employer is obligated to accommodate employees with disabilities. ere is no distinction between a temporary or permanent disability when it comes to an employer's duty to accommodate. Further, there is no carve-out in human rights legis- lation for disabilities which are caused by a certain activity, nor does the prohibition on employment discrimination require the dis- ability to arise from a reasonable activity or work-related event. It does not matter when or how the disability arose. As such, an employer must accommo- date temporary disabilities arising from an injury the employee sustained due to risky activity while off duty to the point of undue hardship. Undue hardship is described as the limit past which an employer does not have the obligation to accommodate an em- ployee. ere is no set formula for deciding what constitutes undue hardship. e fol- lowing are some factors that human rights tribunals will look at when determining if there is undue hardship: • e fi nancial cost (and maintaining a pro- ductive workplace) • e disruption of a collective agreement • e risk of problems with other employees • e size of the business and interchange- ability of the workplace • e health and safety risks attached to the accommodation. Notably, the duty to accommodate may be diff erent in cases of a permanent dis- ability versus cases of temporary disability. In many instances, a long-term accommo- dation is more likely to reach undue hard- ship than a short-term accommodation. Further, while certain accommodation measures may create an undue hardship for one employer or service provider, the same measures may not pose an undue hardship for a diff erent employer or service provider. For example, the manager of a business with three employees may not be able to accommodate a request for revised work hours, even on a temporary basis, as easily as a manager who has 25 employees. Generally, long-term accommodations are also more likely to have a larger impact on smaller employers. With regard to the costs of accommodation, it is generally accepted in law that an accommodation may place a fi nancial burden on the employer. e cost must be more than trivial in order to be classifi ed as undue. e following expenses are not normally considered to constitute undue hardship: overtime or leave costs that the employer can tolerably bear; purchasing or modifying tools, equipment, or aids; altering the premises to make them accessible; off ering fl exible work schedules or rehabilitation programs; hiring an assistant; using temporary employees; and expenses incurred to respond to a grievance or a minor disruption to a collective agreement. As with any accommodation or disability management issue, whether an employer must accommodate an employee's tem- porary disability resulting from off -duty activity will depend on a myriad of factors including the nature of the employee's dis- ability and the employer's operations. Manager fi lling in for sick employees Question: If a manager fills in for sick employees on a regular basis and performs their jobs while filling in, is the manager entitled to overtime pay?